» Finding High-grade (again) at K-7! 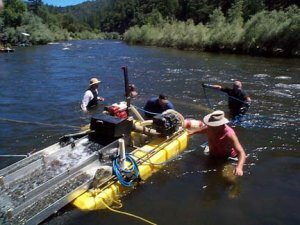 We recently completed a very productive week-long (dredging) Group Mining Project on our Kinsman Creek claim (K-7), which is located upstream on the Klamath River about 30 miles from Happy Camp. We had done an earlier Group Dredging Project on this same claim a few years ago and actually broke our gold production record there. So we felt pretty good about investing another week to develop more of the claim’s underwater gold deposits. There were 24 of us involved with this most recent Project, including myself and my longtime, trusty assistants, Jake Urban and Jeff Butcher. Richard Dahlke was present to give us some help, and Otto Gaither has also been helping us out with this year’s week-long Projects, taking on the job of “? ?Shore boss” ?? which basically means keeping all of the gear running, team needs supplied and resolving most of the organizational challenges which come up along the way. Having a full-time “shore boss” on a Project allows me to spend more time working with participants to sample for high-grade pay-streaks. From a long history of prospecting on this section of river, we already knew before this Project started that there is a rich line of gold nuggets, flakes and fines traveling down the far side of the river, and a strong line of fine gold traveling down along the highway-96 side of the river. Members have mined different high-grade and moderate-grade pay-streaks on K-7 over the years. Our basic plan for this Project was to dredge test holes between the areas where others had already established high-grade. We believed it was likely that we could discover more high-grade that had been overlooked by the earlier mining activity. The main problem we were facing early in the week was that the Klamath River was still flowing abnormally high because of the record amounts of rain we had last winter. High (fast) water was making it nearly impossible for us to complete sample holes out in the middle of the river. Our first day was devoted to setting up a base camp for the Project, and also launching 4 dredges and a small boat onto the river at K-7. I used the boat all week to ferry people, gear and supplies around to both sides of the river along the entire length of the claim. We set up a great camp in the shade right there on K-7 in large pull-off areas on both sides of Highway 96. This made it possible for most of the participants to visit before and after project hours. Otto and others organized some great potluck meals every evening throughout the week. It was a great camp! On the morning of the second day, we split ourselves into 4 teams. On dredging Projects like this, we normally form up our initial teams based upon the relative experience levels of the people who are involved. Then, we direct each team to dredge test holes in a coordinated sampling program, taking on tasks which each team is comfortable in performing. The advanced team normally samples the more challenging areas (deeper or faster water). 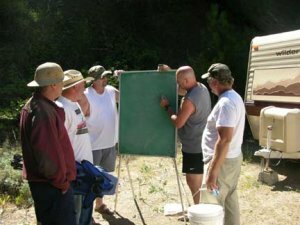 The least experienced group (usually consisting mostly of beginners with a team manager) samples in the less difficult areas (shallow, slow water). 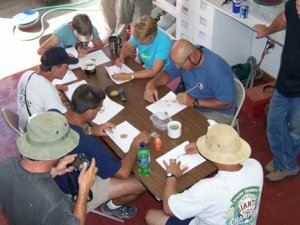 Those with moderate experience pull together in 1 or 2 teams to sample and dredge in those areas which require some skill, but are not too difficult for those who are involved. 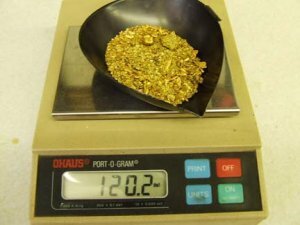 In this way, we are able to utilize all of the Project participants in a well-orchestrated sampling plan in search of high-grade gold. As the week evolves, we keep adjusting the teams so that everyone is given an opportunity to participate in a variety of ways according to their personal level of skill and competence. Several of the participants who began this week with no past dredging experience stayed with that same dredge all week. Others progressed to helping perform very productive dives on the advanced dredge before the week was over. Through some juggling around, we are always able to find a good place for everyone to contribute to the mining Project. We place a lot of attention with the beginners during the first day or two of these Projects. The idea is to help them through the initial steps so that they can become more productive participants in the ongoing sampling and productive aspects of the bigger program. Beginners are graduated to more advanced work as the days go by and the sampling program evolves. All of the effort combines to a very effective mining program. We were very lucky during this Project to have Jeff Butcher on board as the team leader of the beginner-dredge. Experienced dredger that he is, Jeff’s lifelong professional background is in firefighting and emergency services. He also has a bottomless depth of patience and understanding, while never losing track of the work that needs to be accomplished by his own team. 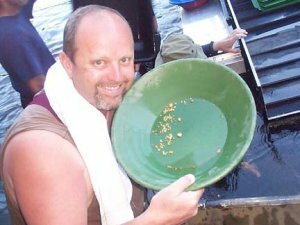 So in addition to bringing his full team up to a level of competence within the first few days of the Project, Jeff’s team also discovered and began developing a moderate-grade gold deposit using a 5-inch dredge right on the first day! 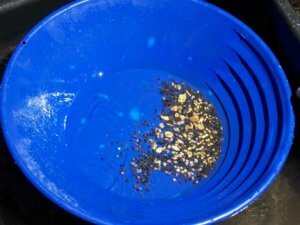 While some of Jeff’s people were graduating off to other dredges during the week, the remainder stayed there and contributed to a substantial part of the week’s gold recovery. Richard Dahlke put a very productive team together consisting mostly of participants who had some amount of previous dredging experience. They dropped a 6-inch dredge down river to about mid-way on the claim; and again, managed to get into a moderately-rich pay-streak on the far side of the river. Through some trial and error, they quickly discovered that most of their gold was being recovered out of a gray hard-packed layer up off of the bedrock. 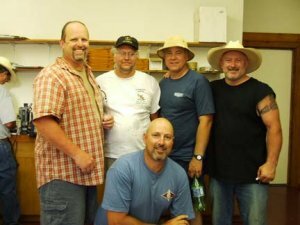 So they quickly organized themselves into a production crew, and devoted most of the week trading off in shifts to contribute to the ever-increasing amount of gold that was adding up in our bucket. 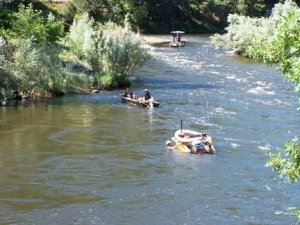 Jake Urban also put a team of moderately-experienced participants together and launched a substantial sample out into the river from the high-way 96 side of the river. Jake is more of an aggressive, competitive team leader. He is happiest when his team is producing the most gold during a Project. So we directed Jake’s 6-inch dredge to an area where they were challenged with faster water conditions. The gold deposit they found there was richer than what the other two teams were mining, but it still was not the high-grade that I was hoping to find on this claim. Again, higher water levels were making it nearly impossible for us to push our sample holes out into the middle of the river where we anticipated that the highest-grade gold deposits were going to be. We were doing the best that we could under the circumstances. a tough decision that I am often faced with during these Projects. We always spend some quality time as a group in the mornings discussing the situation as it develops and debating various solutions. Our 4th dredge team on this Project was being managed by Rick LaRouque. Rick was joined by several other moderately-experienced dredgers. But these were some seriously motivated guys! They started referring to themselves as the ? ?”A-team’ from the very first day. Everyone in the Project agreed that’s exactly what they were! As the A-team was prepared to do just about anything to strike high-grade, we decided on the 5th day that the other 3 teams would continue to recover as much gold as possible from the moderate-grade gold deposits, while the A-team continued sampling for high-grade gold. So we floated their 5-inch dredge down towards the lower-end of K-7, not far from where other members were dredging high-grade just last year. I spent a lot of the 5th day working with the A-team. Time was running out! And while we kept picking up signs of the high-grade that we were looking for, high, fast water out in the middle of the river was preventing us from getting far enough out there to reach beyond where the earlier members had already mined. Fortunately, the water release from the Irongate dam was reduced just in time, and the river dropped about a foot by late on the 5th day. This made a huge difference in the speed of the water out in the middle and allowed us to reach out into the river just far enough to strike high-grade before the 5th day was finished. The streambed material was shallow out there, so we were able to uncover enough bedrock to see gold scattered all over the place. That’s when we uncovered some very nice nuggets! As hard as they worked for it, in all of the Group Projects I have been involved with, I am not sure I have ever seen a more excited group of miners. The A-team seriously wanted to dredge until it was too dark to see! 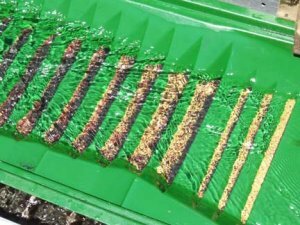 No question, in just an hour or so, they had recovered more gold on their single 5-inch dredge, than all the combined gold recovered from the other 3 dredges for the entire day! The thing about high-grade is that when you uncover it, the whole world changes to a much better place. Especially when you first discover it! I was fortunate to be down on that particular dive with Buzz Schwartz. 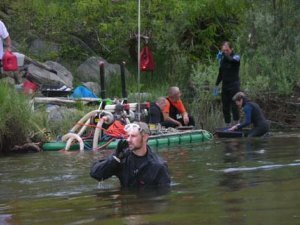 The A-team had just reached bedrock on a sample in the middle of the river and said they thought they had seen some gold during the dive. Buzz and I went down to open up the hole and have a closer look. About 30 minutes into the dive, we uncovered a crack in the bedrock that was just loaded with golden treasure! Each time we expended the hole, we just kept uncovering more beautiful flakes and nuggets. Even underwater, I could hear Buzz yelling out his personal excitement. ‘Exhilaration” is the best word that I know of to describe the feeling that you experience when uncovering high-grade gold. I’m serious; I cannot think of very many things in this life that will prompt a more exhilarated feeling than what you experience when you uncover Mother Nature’s rich, virgin treasure! That’s also the way everyone felt in camp that night when we showed them what we had found! While all of this additional activity slowed everything down bit, I felt it was important to give everyone on the Project a chance to see what real high-grade gold looks like when you find it. Perhaps this was even a greater reward than getting a share of the gold. 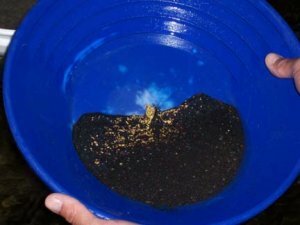 Because once you have actually seen high-grade gold, you will thereafter always know what you are looking for during sampling. It is one thing to hear or read about it. It is quite another to actually experience high-grade as it is being uncovered from the bottom of a waterway. Dredging high-grade gains you some personal certainty that Mother Nature’s rich natural golden treasures are right there for the taking. All you have to do is go out and find them. Finding high-grade once lends confidence that you can find it again. As usual, there was very little I could do to participate in the last day of dredging out on the river. So I spent much of the day leaning back in the boat, watching with pride how all of the team participants enthusiastically worked together. They were pushing to recover as much gold as possible during the time remaining in our Project. They knew how to do everything without any further direction from me. Watching them discuss and work out a production plan together, once again, made me reflect upon how lucky I am to be part of these mining Projects. 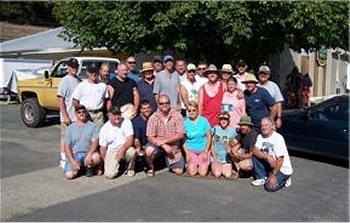 Most of these people did not even know each other only 6 days before. Yet, here they were on the river working together as an experienced team of prospectors who had overcome all of the unknowns that we began with, worked their way together through some pretty difficult conditions, kept the faith throughout the whole process, and pulled off a wonderful success in the end. The transformation of group chemistry during these Projects into something really rewarding never ceases to amaze me! With that amazement always comes my own personal sadness that another fantastic partnership will soon end. Still, I am certain that meaningful friendships are sparked on these Projects that will last a lifetime. Everyone participates in the final clean-up steps, and every participant receives an equal share of the gold. In all, we recovered 120.2 pennyweights of gold. That’s about 6 ounces. There were 327 nuggets in all, which allowed everyone at least 14 nuggets. There were a lot of smiling faces on Friday afternoon!